This timely and authoritative set explores four centuries of good times and hard times in major economies throughout the world. 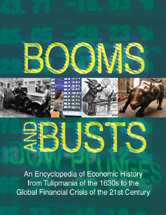 Nearly 400 signed articles cover events from Tulipmania during the 1630s to the U.S. economic stimulus package of 2009, and introduce readers to underlying concepts, economic theories, recurring themes, major institutions, events, and notable figures. Council of Economic Advisers, U.S.